As I mentioned in earlier posts, getting a breathe of fresh air much less some elbow room can be a challenge during tourist season in National Parks. Utah National Parks are special because many offer backroad access that is inaccessible by tour buses. 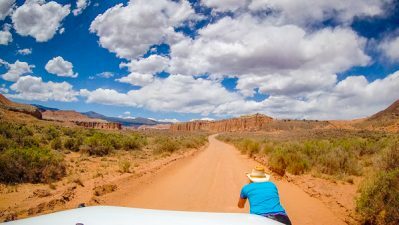 Capitol Reef is just one of the parks with Scenic Backways that serve up little known wonders for admiration and exploration. I almost used up all of my digital film on this ride! If you decide to travel these dusty byways, remember it will be a lonely ride – we rarely see other vehicles. There are no services in these remote areas either. Be sure to pack at least a lunch and take copious amounts of water. According to Ranger Lori, there are mountain lions (among other things) hunting out here so make sure you have enough fuel to safely flee any dangers! 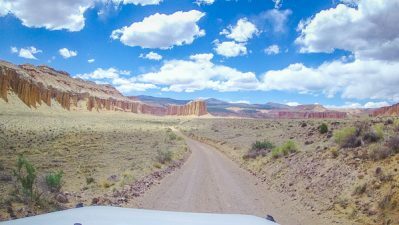 We explore two Scenic backways while we camp at Capitol Reef. 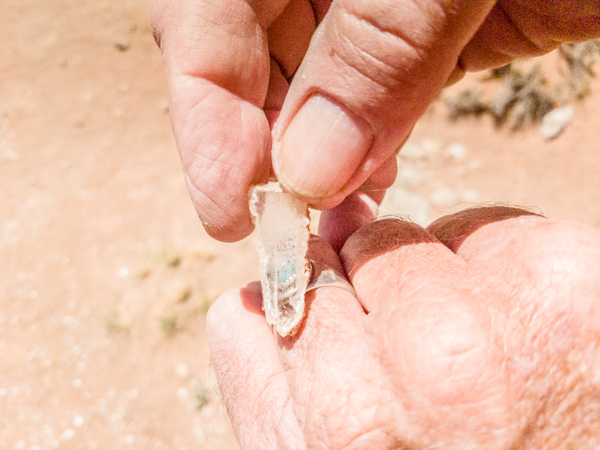 The Burr Trail-Notom Road Loop leads to oyster shell fossils preserved in an ancient Utah seabed. 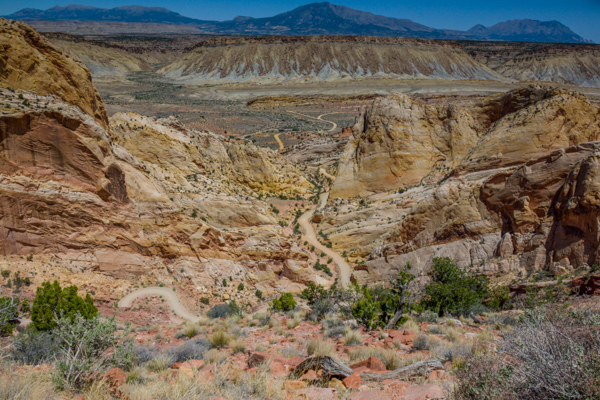 This trail then wanders up the exciting Burr Switchbacks and through a remote part of Escalante National Monument. Cathedral Valley Road crosses in and out of Capitol Reef NP through varying and incredible landscapes. One of the stops, Glass Mountain, baffles us at first because with no internet connection we were not able to determine how it was formed. Later Googling reveals that it formed as a plug of gypsum (selenite) was pushed up to create this mound. 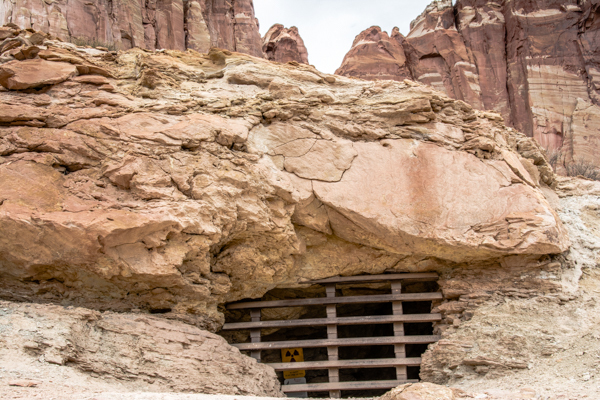 Abandoned Uranium Mine along the Scenic Drive inside Capitol Reef. Doctors of the time prescribed wearing a bag of uranium around the neck to relieve rheumatism. Looking down on the Burr Trail Switchbacks, just off Notom Road. I am so glad you enjoyed it! We will be looking for you at OSH too! Pretty nice, do you think my 2wd pickup could navigate those back roads? If it can next time out that way I may bring it and ride through some new territory. BTW finally home!!!!!!!!!!!!! We saw a car in there so I am pretty sure your pickup will be fine. The 6-7″ deep creek that we ford at the end is the most difficult part. A few rocky rough spots on a section of switchbacks, but with a little clearance no problem. Mostly just dirt roads like Valley of the Gods. Glad you made it home safely. Looking forward to seeing you again in SD!